We arrived two days ago in our Mbono River camp and have had an action packed time since our arrival. After checking our guns on the first afternoon we were ready for an early start yesterday morning. Not more than half a mile from camp we spotted some cape buffalo and quickly got off the vehicle to begin our approach. The closer we got the more buffalo we saw, until we finally estimated more than 200 head. We had to move to the East to keep the wind in our favor, and eventually were able to move around the herd until we were in front of them. I can’t tell you how exciting it was to have these unbelievable animals feeding towards us at less than forty yards! One bull in the lead group was very mature with close to a forty inch spread. Because we needed to get our cat baits up and going, as well as needing camp meat, I decided to take him. Just as I was about to shoot he spotted us and whirled to run. I held my shot with the .375, thinking I was going to have to pass the opportunity. Just then he stopped and turned for one last look, and I promptly popped him in the neck putting him on his back. Doug Mcneil and I immediately ran around the back side of him and as he was regaining his feet, I was able to hit him again from the front. The shot entered his neck and traveled the length of his body putting him down for good. the last shot was up close and personal at about ten yards … not a bad way to start a hunt! The balance of the day was spent butchering the bull and hanging leopard and lion baits. This morning we went straight out to check the baits and saw two leopards feeding from the first bait. After checking the second bait with no action we returned to build a blind at the leopard spot. We finished the blind a little too late to move in for the afternoon so we will return tomorrow, PM for first official cat hunt. My hunting partner, Ray Murski, killed a nice Zebra (as I write this there is a hyena whooping about a half mile from camp) and made some baits of his own. Last night, one of the baits was hit by a lion but, from the tracks it is not a mature cat. He will check the baits again tomorrow to see any new action. That’s the update; tomorrow should be exciting and I will post the results of the day. If you don’t hear from me, you will know things were slow. As we all know, the advance of modern technology exceeds the speed required by the human brain to keep up. As one who is still struggling to learn the different ways a computer can make my life simpler, combined with my struggle to keep up with the latest in both video and video editing equipment, there are those rare moments when I find good reason to continue my battle to keep abreast of all modern technology has to offer. As most of you know I have been a strong proponent of proper wildlife management, not only on my ranches, but in every location I have hunted for the last fifteen years. I have carried my management philosophies and criteria to such remote locations as Tajikistan, at altitudes greater than 16,000 feet, where I turned down a magnificent 58 inch Marco Polo ram because close examination revealed he was still too young to shoot. You can tell this in sheep because a ram in his prime has a very rounded posterior, whereas an old ram past his prime has a rear that is angular to the degree of being pointed. My Russian guide thought I was crazy for passing this ram, as doing so meant another 2000 foot climb to kill an old ram that was much smaller than the one we were looking at on the basin floor. My logic was that I was planning to come back the next year and, by then, this ram may be the ram of my dreams, exceeding 60 inches on each horn. Long story short, I never made it back and this ram probably died of old age, but not before breeding many more ewes; I still think it was the right thing to do. 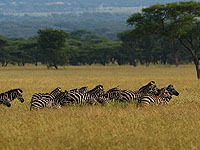 What does all this have to do with lion hunting in Tanzania, you ask? The answer is that yesterday we discovered a buffalo kill made by a pride of lions only two kilometers from our base camp. In this pride was the finest lion I have ever seen. We spent yesterday afternoon with the pride trying to get a look at the cubs, lionesses, and the male, to confirm the dynamics of this particular pride before making a final decision on whether or not we should try for this male. As darkness fell, we were undecided, so we returned this morning after a night full of lion calls, and again spent several hours trying to determine if the cubs were of sufficient age to survive without there patriarch (I hear him roaring as I write this at 11:39 PM). Without a clear answer to our dilemma, a call was placed via Sat-phone to the main office of Tanzania Game Trackers in Arusha. Further discussions were held, and a great volume of lion research data was consulted. Additional calls and e-mails were made until this decision reached the very top of the food chain in the organization and the executive order was given. The Verdict: This lion had been with the pride for at least three years, he has been the dominant breeder during that time and the subadult cubs could survive without his further protection. 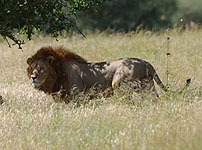 The lion is at a point where natural succession is imminent and to wait longer would very likely guarantee that he disappear from his current role as pride leader, only to be taken apart in a solo battle by his mortal enemy, the hyena. It is difficult for me to express the emotional rollercoaster this process has taken me on. My fundamental belief that wildlife management is more important than trophy harvest has been fighting with my primordial instinct which says to hunt this magnificent creature no matter what. Finally, after employing all that modern technology and good science has to offer, the hunt is on. Does this mean I will most definitely get him? Most definitely not. Lions have been known to feed at a kill until there bellies are full and then move on for several days to mark there territory. When no lionesses are in estrus there loyalty to the pride is limited. Tonight, even though we wern’t hunting the lion, we had an unbelieveable experience. At 6:20 PM we heard a noise close to us as we were preparing to exit the blind. Only one of the three of us could see what was creating the commotion so close to us. It was a very large leopard that had climbed a tree only 16 yards away, to gain an advantage over the grass to see how best for him to steal the lion’s bait. We got it on on video prior to his departure, once he became aware of our presence. It was the second closest I had ever been to a leopard. The closest was in South Africa in a ground blind set up next to a dry river bed. 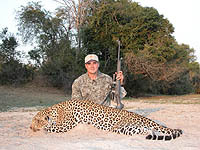 The leopard came in along the riverbed and sat at 6 yards from the blind. Once he smelled us he departed rapidly with no opportunity for a bow shot. So our hunt for the lion we could not kill was prosperous from the standpoint of giving us a once in a lifetime experience. Knowing that tomorrow offers similar opportunities, as well as the chance for Mr. BIG only increases the excitement. Does this mean I probably won’t sleep tonight, due to extreme anticipation? You bet! This is the most magnificent African trophy I have ever seen and the simple prospect of having a crack at him is more than I could hope for. Whatever happens, I can be certain the right amount of decision making went into this plan. We will do our best to take him if we can. But the excitement is less in the kill than in the anticipation of the hunt, and the anticipation is absolutely unbelievable for me right now. There will be a sequel to this story. I don’t know what the final outcome will be. But isn’t that what hunting is all about? I hope all of you are as happy as I am right now! 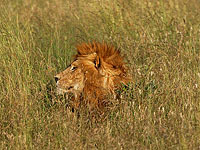 This morning, I finally got the lion we have been hunting for the last five days. After having seen him twice before we could determine he was OK to shoot, and then not seeing him for a couple of days, it was a great relief. Last night he was within sixty yards of my tent. He was roaring from two AM on, but I don’t think he roared when he made the tracks just down by the river. It always sounded like he was more like two or three hundred yards away when we heard him. At first light we were in the blind where we had been baiting him. He never showed, although some other members of the pride fed on the bait (mostly cubs). After about two hours the hunting vehicle came rushing in without being called. We all knew they must have seen him or they would not come in. We all thought that we heard the pride kill a buffalo last night, and as it turned out, that is what happened. As it got lighter, the trackers spotted him on his kill, a nice buffalo bull, and came in to alert us. We rushed out of the blind and back to the spot where they had seen him. He was still there, so we drove down wind about 200 yards and jumped off the cruiser to make a stalk. 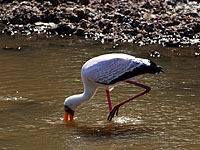 At about 100 yards several yellow billed storks rose from the stream bed alerting the lion that all was not well. He immediately ran offering no shot opportunity. Our next plan was to build a blind and wait overlooking the buffalo he killed with his pride. After locating a logical sight, we left to get the vehicle and go to the opposite side of the river to pull the buffalo carcass up out of the bottom to a location where we could see it when they approached it again on the late afternoon. As we were approaching the location of the kill, one of the trackers spotted the male laying about three hundred yards from the river. 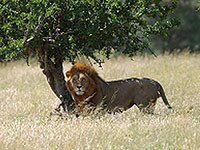 We stopped the truck and began a stalk that brought us within 100 yards of the lion. He was quick to spot us and begin moving away. The shooting sticks were set up and I found him in my crosshairs, but could not shoot at the angle he was giving me. 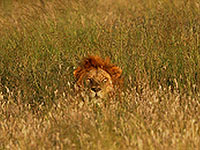 Before disappearing into the tall grass he turned to look back one more time. Doug gave me the go ahead and I sent a .375 through his front shoulders. He growled and began spinning around but before I could shoot again he disappeared in the grass. His lionesses began crouching and pointing their bodies in our direction. As one of them began flicking her tail over her back, which is the first signal of a charge, Doug suggested we move back. As we did so, they made the decision to retreat, ending a very exciting sequence of events! We then approached the downed lion with all the anticipation of a covey rise when quail hunting. I commented to Doug the similarity, to which he replied” these quail can bite!” At about sixty yards I spotted him laying in the grass and after a minute or so we determined he was not moving. We still repositioned to where we were approaching from his back side and got right up to him, poking him with our barrels to ascertain he was finished. As I had hoped the shot had gone straight through his front shoulders, undoubtedly taking out his heart, or the blood vessels on the top. He was magnificent! We spent nearly an hour taking still photos and loading him into the vehicle for the trip to the skinning shed. First, we stopped by camp where the entire camp staff sang the lion song while carrying me around in a chair which they jointly hoisted in the air. This went on for quite a while, followed by more photos with the camp staff, lots of hand shaking, and then the trip to the skinning shed. That’s the story. It was a hell of a day, and one I will never forget! Later we found a black spitting cobra seventy yards from camp and spent quite a while trying to get him out of the rock pile he was in. At one point he came out long enough to spit at me (which I got on video), then he went back into the rocks where he hissed terribly as we prodded him with the shooting sticks. Juma, our head tracker, was absolutely fearless of this snake, and is the first local I have seen who was not terrified by any type of snake. I have no doubt he would have caught it if given the chance. We had to call him away from his pursuit in order to depart for the afternoon hunt. All in all it was quite a day. 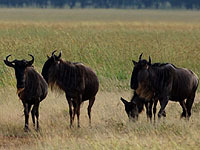 When we returned to camp, we found that Ray and Mandy had taken a nice wildebeest, and had also spent a great deal of time stalking in on three different group of cape buffalo totaling about 500 animals. They never saw a mature shooter bull and decided it was too early in the trip to shoot a lesser animal. We just finished a very exciting buffalo hunt that resulted in the taking of a bull buffalo that was as old as I’ve ever seen. After several hours of walking through some of the most interesting country I have ever hunted, and seeing a variety of game (including one large solo buffalo bull that came busting out of a thicket shortly after we passed), we were able to locate two old bulls late in the day. Our first sighting of the bulls was at about 200 yards, and we could see one of the bulls had a nice spread. The area in which we were hunting at this point was recently burned, so ground cover was limited. There was a good deal of brush between us making a shot impossible and horn judging quite difficult. The only option, as the two bulls seemed already to be aware of our presence, was to begin crawling on our stomachs to get a better look. At about 150 yards we could see the bull on the right carried horns that were wider than any we had seen in a week of hunting. The bulls were steadily staring in our direction so, at this point, Doug and the tracker stayed back as Michael Viljoen and I continued to crawl forward. I was able to belly crawl to 100 yards before the bulls began to get nervous. 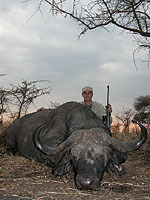 This was to be my second buffalo from this area, which would end my buffalo hunting from this camp. As he looked at me, trying to decide what I was, I tried to determine how wide his horns were in relation to his ears. I had been told that the ears, in a relaxed position were 32 to 34 inches. this bull had at least eight inches sticking out on each side of his ears, meaning he should be at least 48 inches wide. I could see his boss was not exceptional, but with this kind of spread, and one more buffalo on my license, I decided I would be crazy to pass him given the number of buffalo we had seen so far. I lined up my scope just left of center of his chest from a prone position, tried to find the most open path for the bullet, and let fly. The huge bull rocked back as the 300 grain Remington Safari Grade slammed into him. He recovered and began to run to my left. By then I was on my feet and hit him again, solidly about a foot behind his shoulder. Within thirty yards he faltered, stood momentarily, and crashed to the ground. We advanced to within fifty yards of the downed bull and this is when things really began to get interesting. His companion had stopped and looked back to see what was happening. At that moment the old bull gave his death bellow which changed the whole demeanor of the fleeing bull. He reversed course and returned to within 20 yards of the downed bull, putting him about 80 yards from us. He would look from us to the downed bull and shake his head. After the third head toss he came forward about 7 to 10 yards. We readied our guns for what we thought would be a definite charge. After a good bit of yelling at the bull, discretion on his part prevailed and he began a slow but steady retreat until he was out of sight. What Robert Ruark wrote so many years ago is definitely true: when a cape buffalo looks at you, he looks at you as if you owe him money … lots of money! The whole hunt beginning with the magnificent scenery of a series of rock kopjies, and ending with the taking of the bull was one I will not soon forget. Upon examining the bull we found an array of scars ranging from a healed would on his lower front leg that proved he had survived a poachers snare, to a multitude of scars on his neck, shoulders and flanks that seemed to indicate many fierce battles with both other buffalo bulls as well as a number of lion attacks. In measuring the spread on the horns we came up with 42 3/4 inches; well less than our estimate. This discrepancy was accounted for when I drew two lines in the dirt which corresponded with the width of his ears, and then taped the distance at 27.5 inches. From now on, I will use 28 inches as the benchmark for determining overall spread. Regardless of the measurement I am thrilled to have had an opportunity to experience a hunt for such an old, scarred, bruiser of a bull. The moments of anticipation which occurred after he was down, waiting to see what decision his partner would make were priceless, and a snippet of time I will always remember. Best of all, we have a happy camp staff as they are well supplied in meat. and in the next camp on the Ugalla River I have another opportunity to hunt this amazing creature! My hunting partner, Ray Murski, continues to search for a buffalo of his liking. He came close tonight, but at the last minute the bulls got scent of the hunters when it began to switch back and forth. Leopard remains at the top of his list and prospects are getting better everyday. Time is still on his side with many days left before we change camps. I hope all of you are well, and I will continue to update you on the progress of our hunt. 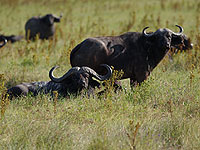 I should also say that Michael Viljoen got excellent video of the buffalo hunt! Things are going well over here. Three days ago I missed a real nice impala at 140 yards. He had a great shape with pretty good length, and I just pulled or rushed my shot. He was good enough that the next day we went back and spent about four hours walking in the area and finally relocated him. After a good bit of sneaking and belly crawling I was able to end up with a shot of about 75 yards. This time he wasn’t so lucky. I hit him just about right and he only went 50 yards before going down. He measured 27 inches but has the classic outswept horns at the top. I am sure I would rather have this ram at 27 than one with 29 inch horns and still coming in at the top. That afternoon Doug (my PH), drove us to a place where the baboons climb up on these rock kopjies at night. Just at sundown we videoed me shooting one off a ledge from 300 yards. 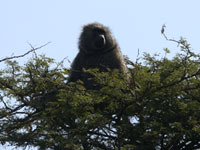 It was pretty dramatic footage, with the baboon falling from the ledge. I was using Doug’s new, 300 Winchester Magnum rifle from Christiansen Arms, and it shot very well. Since then, I have been busy shooting Spurfowl and Sandgrouse which has been fun. They cooked some up over the fire on kabobs and I have never had a better tasting bird! I also went with Ray on a buffalo hunt and was able to video him taking a nice old bull with a perfect heart shot at about sixty yards. 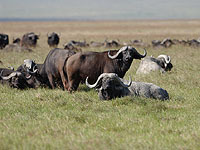 It was a long and arduous stalk that began with a sighting, followed by a good deal of tracking to catch up with the herd, and ended with some tense moments trying to find an opportunity at the old bull with all the other buffalo who were feeding and milling around. He was thrilled with his first cape buffalo! I also accompanied him to a leopard blind but we had no luck. Last evening though, Doug, Michael Viljoen and I went to a blind we set up at one of our baits, and we had a leopard come in at about 6:10 PM. The lighting was perfect and I managed to get him going up the tree, feeding, actually hanging from the bait, and descending the tree! I have about fifteen minutes of video in total. He went up the tree a second time and fed again by hanging from the bait. Just as my tape was ending, his back feet lost their purchase on the bait which left him hanging by his two front paws. If I had had three more seconds of tape I would have captured him falling twenty feet to the ground! I guess you can’t have it all. I am very happy with the tape I got, and am hoping to video a kill in the next camp. With this cat, I had no interest in shooting him, as he was a young male of about 130 pounds. He was very beautiful to watch, though. In two days time, we move to the Ugalla Camp where I can begin hunting for leopard, crocodile, another buffalo, sable, kudu and roan antelope. Until then, I will continue to try and help Ray kill a leopard here, by setting up and monitoring baits. We had a good hit on one last night and, if he has had no luck on his baits, I will go with him to this spot in hope of videoing his kill. The track is large so I’m sure it’s a very big leopard. It should make for an exciting afternoon hunt! Here is the latest information on my trip. I have had some difficulty with the Sat-phone, so am a little behind. I now think I have the problem corrected and will be able to send regular reports from now to the end of the trip. The two last days at the Mbono Camp were good ones even though I had shot most of the animals on my license for that area. I went with Ray Murski one of the mornings and he got a nice buffalo which I videoed. It was a good hunt with Ray making a fine shot at about sixty yards.We had picked up the tracks of a sizable herd early in the morning, and followed them for about two hours before coming into contact with them. It was difficult to pick out the oldest bull and get a clear shot at him. The bull was quartering towards, and Ray hit him right on the point of the shoulder. The old buffalo bull only went about 100 yards before going down. He was about fifteen years old and had a 37 inch spread; just the kind of bull that usually causes lots of trouble. 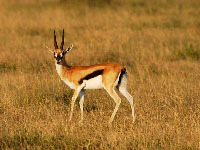 In the afternoon I went out to look for a Thompson’s Gazelle. We saw many and finally found a mature ram that had 12 1/2 inch horns. 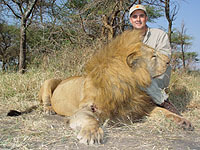 They are not very challenging to hunt but are excellent eating, and that was my main reason for shooting him. The shot was 140 yards and I shot him from a sitting position. Later, as we were walking to get to a plain in hopes of finding some eland, we bumped into a Serval Cat. He saw us at the same time as we saw him and ducked into some tall grass. We moved up until we saw him sneaking away. Doug set up the sticks while I chambered a solid in the 375. I took a shot as he began to disappear behind a tree, and hit him low in the chest. He ran and so did we. After about fifty yards I saw him again running straight away at about forty yards. I threw the rifle up and caught him in the neck, killing him instantly. He was really beautiful, and was an old male weighing about 18 pounds. I am going to have him mounted life-size chasing a sand grouse. It should make an interesting mount. We had a morning hunt yesterday that stretched into the afternoon when we spotted, and began stalking a huge herd of eland. We had to go about a half mile around the herd to get the wind and then had to crawl and sneak for better than an hour to finally get into position to take a shot at the best bull we could see. It was a 150 yard shot and I put it right on the point of the shoulder. It hit where I wanted it to and the bull took off running with the herd. I expected him to go down in sight but they got into the trees pretty quickly. 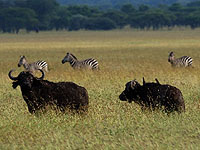 With all the other animals it was impossible to track him, so we walked grids in the tall grass trying to locate the bull. After two hours of searching we had to give up as the plane was due in to get us within an hour. Another team was sent from camp to try and locate him as we were leaving. I should hear something in the next day or two as to what they were able to find. It was a shame not to be able to find him right away but it was a situation that could not be helped. As good as they are to eat, I hate the thought of so much meat going to waste but, as you know, nothing is wasted in Africa. All the predators and scavengers will think Christmas came early if they find the bull before we do. Today, we changed camps to a location about 180 miles southwest on the Ugalla River. From this camp we will be concentrating on Leopard, Hippo, Lion, Crocodile, Kudu, Sable, and I would like to find another buffalo. 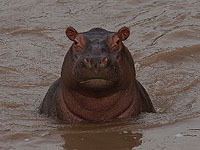 This afternoon I shot a hippo from one of the pools about a mile from camp. It was interesting as we tried to locate a solitary bull and judge him strictly by the appearance of his head. I don’t think I will be qualified to make such a determination on my own for quite some time. At any rate we were able to find a suitable bull and I made a brain shot at about sixty yards. The bull just rolled over in the water. We will recover him in the morning, and I can’t wait to see him! I will send a photo with the next installment. We are having good action here, in the Ugalla River Camp. 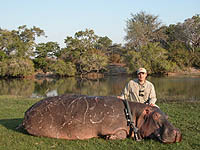 The day after I shot the hippo, we spent our morning and afternoon hanging baits for leopard. We set up four locations along the Ugalla and Walla rivers. That night we had hippo for dinner and it was good. Maybe not the best meat over here but not at all bad. In the morning we went on a long walk along the Ugalla River looking for a big croc. We saw many that were potentially what we were looking for, something approaching 15 feet. We logged in their locations in the GPS and continued on. I guess we walked about seven miles, seeing about five big boys. At lunchtime the truck met us after checking the baits. two had been hit and both tracks were large. Since it was getting late we went to the closest one and began building a blind. We only finished it about 4:30 and immediately climbed in the blind. The whole time we were building the blind there was a group guinea fowl making lots of noise about 200 yards from where we were working. We felt the cat was laid up close to the birds, and not long after the vehicle left, the warning calls of several different kinds of birds began sounding closer and closer to our blind. 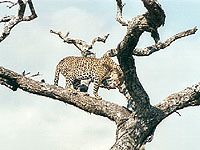 At 5:08 the leopard climbed quickly into the tree! He was only about 45 yards away with the sun shining right on him. He immediately began ripping at the bait and we watched him feed for twenty minutes before I decided to shoot. He was blind in his right eye which looked very unusual. It had a white film over it which almost glowed when the sun hit it. I decided to wait until he rested from feeding before taking the shot. When he stopped feeding he turned to face the blind, and I didn’t want to shoot him from that angle. Just as he turned to reach for the bait I fired with the 375. He froze in place, shot directly through both shoulders, and the heart. After a few seconds, he lost his grip on the tree and slid off the limb. there was a very loud “thump” when he hit the ground. The video we got was outstanding and it will be rare footage having been taken in such good light. We eased out of the blind and moved to the base of the tree where he was laying. What a beautiful cat! I would guess his weight at about 150 pounds with an empty stomach. we took a bunch of photos and I will try to send you one. The lighting was perfect as the sun was just getting low in the western sky. Yesterday morning we walked about twelve miles along the upper end of the Ugalla, looking for more croc. We saw some nice ones but nothing as big as the day before. We have settled on one croc in particular and will set up a blind and a bait to see if we can lure him out of the water for a chance at a brain shot. 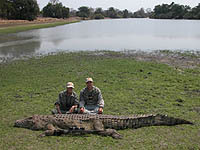 The next day or two will tell the tale on our success with the crocs. 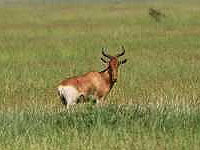 Ray has managed to pick up a great Lichtenstein’s Hartebeest … probably top ten in the records. He also killed a very nice Sable, as well. 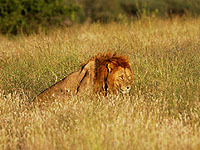 He continues to hunt for lion but has yet to find a big male. 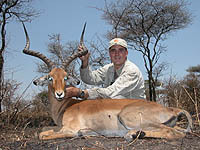 He has had a close call with a big Roan Antelope and bush pig but was not successful. Time is still on his side and I am sure he will have more close encounters over the next few days. I will keep you posted as to our success. This is the final installment in a hunt that could not have been any more action packed. For the last several days we have been intensifying our efforts at finding a crocodile that will exceed fifteen feet in length. The process has involved a search, both on foot and by cruiser, that covered more than forty miles of the Ugalla River. From the vehicle, we could access half of this distance, as the road (really more of a trace) meandered back and forth through areas where the river was visible. The other areas which were covered on foot, were covered several times resulting in about thirty miles on foot, which has been some of the most fun I have had. 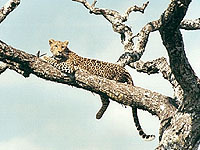 While looking for crocodiles we jumped a leopard out of a thicket at less that twenty-five yards. We also walked up on a monitor lizard that never knew of our approach, as his head was in a hole previously used as a nest by a crocodile. When he saw us he kicked it into high gear in a hurry. We were less than five feet from him at the time! 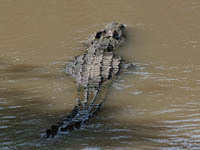 During our search we saw more than 100 crocodiles that would have exceeded ten feet. Approximately half of these would have exceeded twelve feet. I can assure you that, at no point in this forty mile stretch of river, would you be safe in swimming to the other side. It is even uncomfortable to stand near the waters edge, as it is muddy, and not unusual for a set of eyes to mysteriously appear briefly, sometimes within twenty-five feet of the shore. After locating the most promising section of the river that seemed to contain several oversized suarians, we set up a bait by tying some of the remnants of my hippo to a tree close to the rivers edge. Some of the entrails were then placed in the water to get the scent flowing downstream. I also cut two pegs that I hammered into the ground fifteen feet apart, parallel to the river. A grass blind was erected across the river on the opposite shore at exactly 115 yards from the bait. Once we were settled in the blind, I set my rifle up and viewed the pegs through my Leopold 3×9 scope. By turning the magnification up to 9 power, the two pegs almost fit perfectly inside the perimeter of my scope, giving me an accurate way of measuring any croc that swam close to our bait. Over the next two days, in the afternoons when the heat was high, we viewed as many as twenty-one crocs feeding on the bait at one time. I learned much about the alertness and incredible sense of smell these reptiles have. At one point there were seventeen crocs piled on top of one another, all within feet of a very odoriferous piece of hippo. The wind shifted to our backs and it was just a matter of seconds before this entire mass of reptilian flesh erupted into a mad dash for the safety of the Ugalla River. Once in the water only there eyes were visible, and they slowly moved away with only some of the smaller ones returning. We finally settled on two crocs we thought were the biggest of the lot and tried to determine which way they headed after feeding. One of these two seemed to be the dominant crocodile in the area, often chasing the others away from the bait. 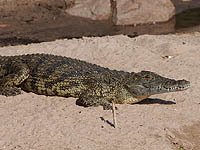 This croc also appeared to be much darker in skin color than the others, which is a sign of advanced age. The other one we were interested in seemed to be slightly longer, but not as girthy, indicating a younger animal. So the decision was made to return the next morning, after the crocs had fed all night, and late enough that they would be out on the banks digesting their food. Thinking this particular croc always headed up river (which was also upwind from the bait) we began a walk along the bank using the trees and ant mounds as cover as we searched for this huge reptile. Almost a mile up from the bait we found what we were looking for. 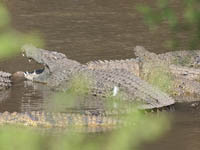 Several crocs, maybe seven or eight, were laying on the bank on the opposite side of the river. In their midst was the dark skinned croc that had displayed such dominant behavior at the bait site. He was laying parallel to the river which, if I could sneak into a shooting position, would offer an excellent opportunity for a brain shot (really the only shot you can take on a croc as just about anything else results in him getting into the river with a very slim chance of recovery). My stalk began on hands and knees about eighty yards from the point at which I felt I could get a shot. I quickly went to my belly as the sparse cover played out. My best chance was to slow down my approach to a snails pace so as not to create any more noise in the dry grass that was necessary, and to decrease visible movement as much as possible to keep from being spotted. this resulted in a stalk of about sixty yards on my belly that took just over 35 minutes. Once I reached the point where I anticipated a clear shot at the croc, I found I had another problem to deal with; the bank sloped sharply away in the tall grass leaving me no opportunity to shoot from a prone position with my gun rested in any fashion. I could not sit up as they would surely see me and head for the water. Six feet in front of me I spotted a stick about as thick as my wrist and about twelve inches long. Protruding from one side of the stick was a branch of about five inches which would solve my dilemma if I could reach it. It was the longest six foot crawl of my life as the cover was minimal at best. Another ten minutes put me within reach of this very important piece of equipment. With it now secured I began to ease my 375 into position for the sixty-five yard shot. It was incredible how solid my rest was with the use of this otherwise insignificant stick as a brace. I lined up my crosshairs half way between the back of the smile and the plate in back of his eyes, and on the top of his head. I tightened up on the trigger, concentrating on increasing the tension until the rifle jumped in my hands. The shot appeared to be on the money and I could hear Doug yelling, “Hit him again, Jack.” There was no need for his concern, as I had another shot on the way almost before he could finish his sentence. The second shot hit right where the first one did, and the big croc never flinched, while all the others were in the water before my second shot was on its way. For an animal that spends the majority of its life either not moving, or moving very slowly, they are incredibly fast when they want to be. After driving upriver to a crossing point and reversing course to the location of the croc, we finally had a chance to examine him up close. It is eerie to walk up on a reptile that big, wondering if he is truly out of the game. We picked up a couple of sticks and tossed them at him, confirming he was dead. He was immense, and two separate measurements confirmed his length at thirteen feet ten inches. I am sure the other croc was slightly longer, but would not have weighed as much as the one we got. It took six of us to load him in the cruiser after taking many photos. Now, I have to decide how I will mount him and where I will put him. These two decisions may have the same degree of difficulty and require a similar degree of finesse, as some aspects of the hunt itself! 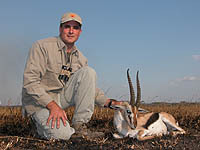 I had a great time on this trip to Africa, from the first day I arrived until the day my hunt ended. I saw three outstanding animals in the last few days of the hunt; a Greater Kudu, a Roan Antelope, and a Sable, all of which I tried for unsuccessfully. Seeing such quality trophies confirms you are hunting in good country that is well managed. I wish I could have gotten them and, with more time, think we could have done so. But our priorities were big cats, buffalo, and a crocodile. On those we had great success during a hunt which was full of high quality stalks and hunting experiences which I will never forget. I can’t wait until I return to Africa. April really isn’t that far away!